My best friend from college, Marisa, is visiting from Key West this week — and when she asked me if there was anything she could bring from Florida, I nearly exploded begging her to bring me some freshly baked Cuban bread. You see, there is literally nowhere in Denver to buy Cuban bread. My favorite restaurant, Cuba Cuba, even has to fly theirs in from Miami. Not cool, right? So when Marisa showed up with a massive supply of Cuban bread, I knew I had to make some mean sandwiches for everyone. There wasn’t time for my usual lechon asado — so I improvised a little with chicken! 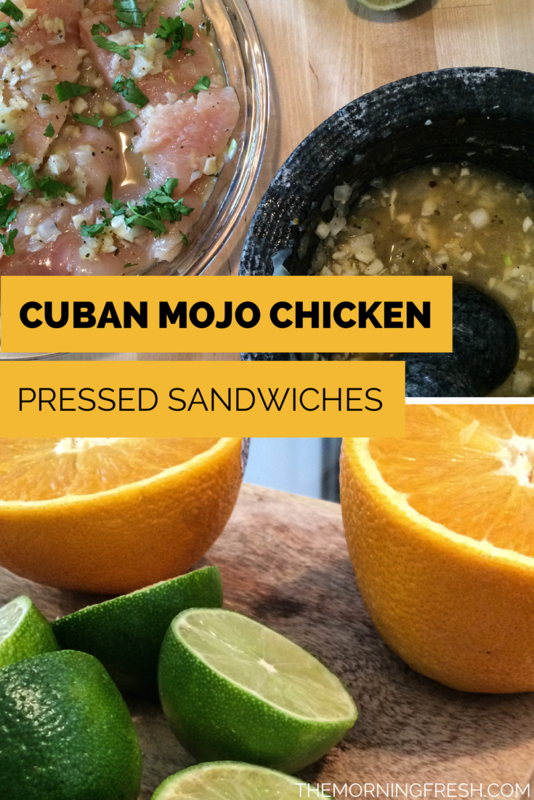 The first step to cooking delicious Cuban meat is making your own mojo to marinate it in. 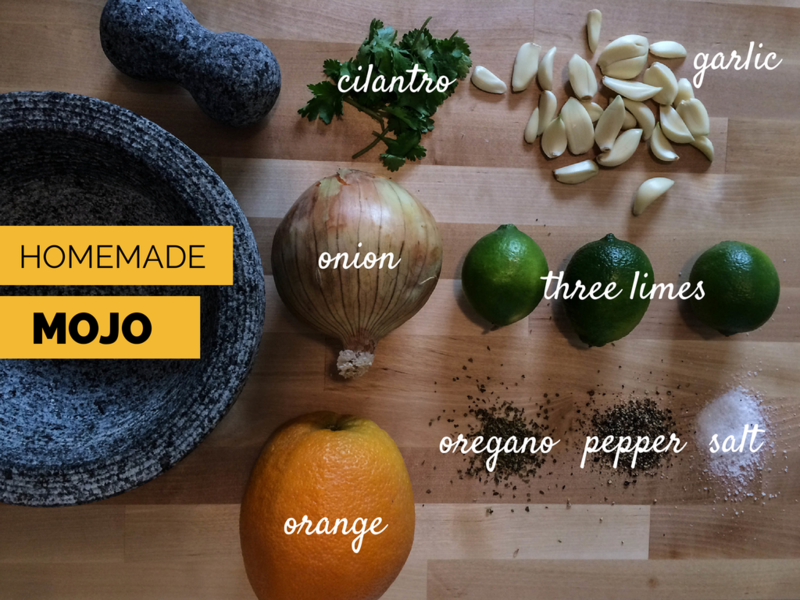 Our household recently acquired a really gorgeous mortar and pestle, so I’ve been going a little crazy with my mojo experiments. It’s just too much fun mashing garlic and onion and spices together — the whole kitchen smells like savory heaven! Here’s a little secret that I must confess: I was so diligent with taking pictures of every step of the recipe and taking notes on my ingredients — but once I plated all four sandwiches, I totally forgot to snap a photo of the final product! I improvised a bit and tried to arrange my plate so you couldn’t notice that I had totally already eaten half of my sandwich, oops. It’s the thought that counts, right? This Cuban sandwich recipe became an instant favorite. I’m finicky with my meat, so the traditional Cuban sandwich with deli ham (yuck!) isn’t quite my cup of tea. The mojo marinated chicken is lean yet so flavorful. If you want an extra Cuban kick, try adding pepperoncini or pickles to your sandwich. 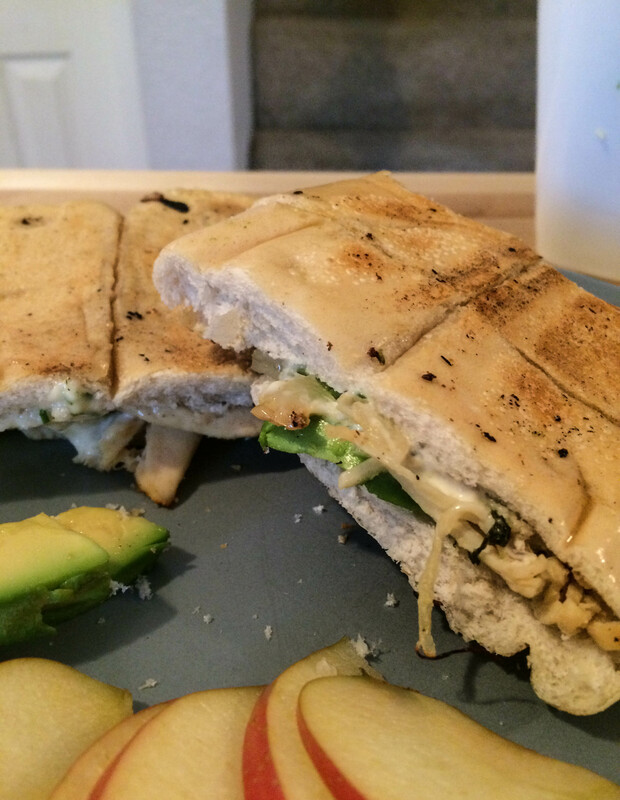 Let me know your thoughts on my Cuban mojo chicken sandwich with garlic aioli recipe! What’s YOUR favorite Cuban sandwich recipe? Pulled chicken marinated in homemade mojo, pressed on Cuban bread with swiss cheese and garlic aioli. Prepare the garlic aioli: combine one part chopped parsley, one part mojo, and three parts mayonaise. Add additional mojo to taste. Pour the mojo over the raw chicken — then marinate in the refrigerator for one hour. Over medium heat in a large cast iron skillet, cook the chicken in the mojo juices. 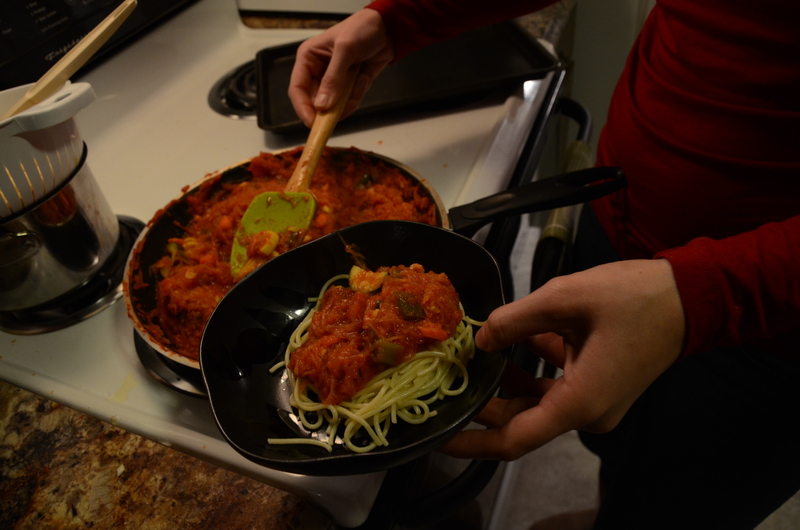 Once the chicken is cooked all the way through, use two forks to shred the chicken in the cast iron. Continue to cook until the chicken lightly browns. Remove chicken. Prepare the sandwiches by slicing the Cuban loaf in half. Spread aioli on one side, add a thick layer of shredded chicken, a slice of swiss cheese, and a few slices of avocado. Butter the outside of the sandwiches. Melt a teaspoon of butter in the cast iron, then add the sandwiches. Using a large, flat pot cover, firmly press the sandwiches as they heat up. **If you have a few bricks easily accessible, you can use them to keep the sandwiches pressed. 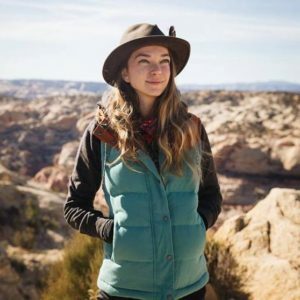 For some folks, the winter season is just an excuse to crank up the heater and indulge in an endless supply of homemade pumpkin spice lattes – but for those of us who live in a house full of dirtbag climbers, the winter months are all about survival. 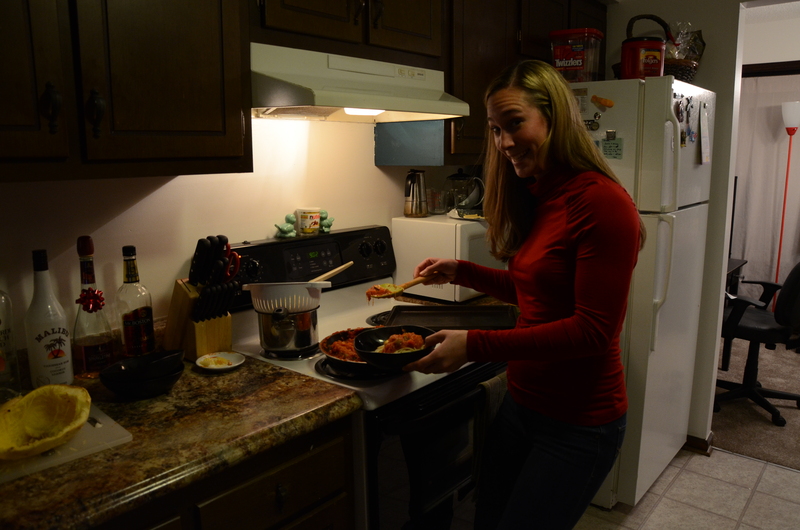 You see, we don’t run the heat, so at this very moment, it’s about 55º in my kitchen – which means everything is cold. So cold, in fact, that when my housemate poured fresh coffee into his tall cup, the glass was so cold that it shattered upon contact with the hot liquid. In a world where everything is cold, hot food becomes a dietary staple. My favorite way of warming up with edibles? Homemade soup! Stew a giant pot of hearty liquid warmth, and you’ve got instant heat to last up to a week. And while I love a fancy soup just as much as the next gal, there’s nothing better than an easy, simple soup. Plus, the entire house seems to warm up with the smells of stewing veggies and simmering broth. 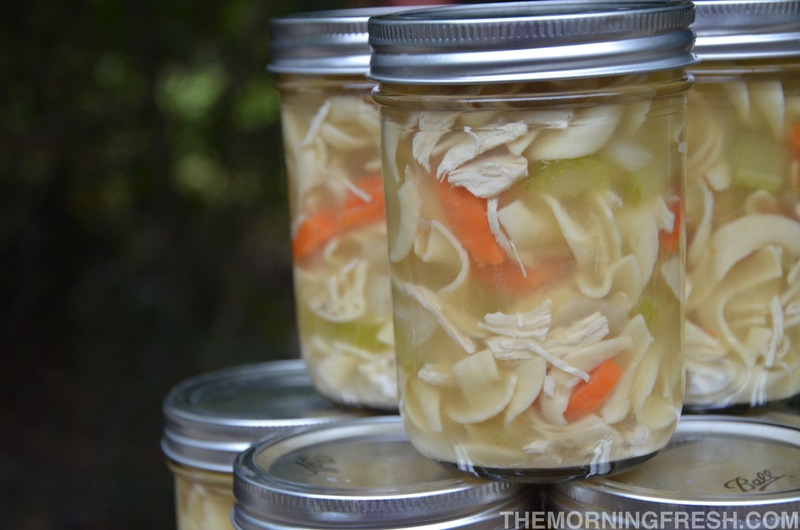 This homemade chicken noodle soup recipe yields 10 mason jars worth of goodness – plenty to last you at least a week – and this may just be one of the easiest soup recipes, ever. The most difficult part of making this soup is merely the effort that it requires to patiently wait for your soup to reach optimal soup-age – but there’s no shame in sneaking a spoonful or two during the cooking process. 50 ounces (6 ¼ cups) of 100% natural chicken broth | Since I’m on a dirtbag budget I used the 99% fat free canned version from Swanson. 1.25 lbs of chicken breast * | We get ours from Earth Fare; it’s ‘local’ chicken from Springer Mountain in Georgia! 4 cups of water | Purely to add to the soup as it cooks; additional water will be used to boil the noodles. * Bonus Points if you get these items from a local farm or market! 1. In the biggest pot you’ve got, start boiling some water. Chop your chicken breast into smaller pieces (think about 8 per breast), and toss ‘em into the water to boil. 2. 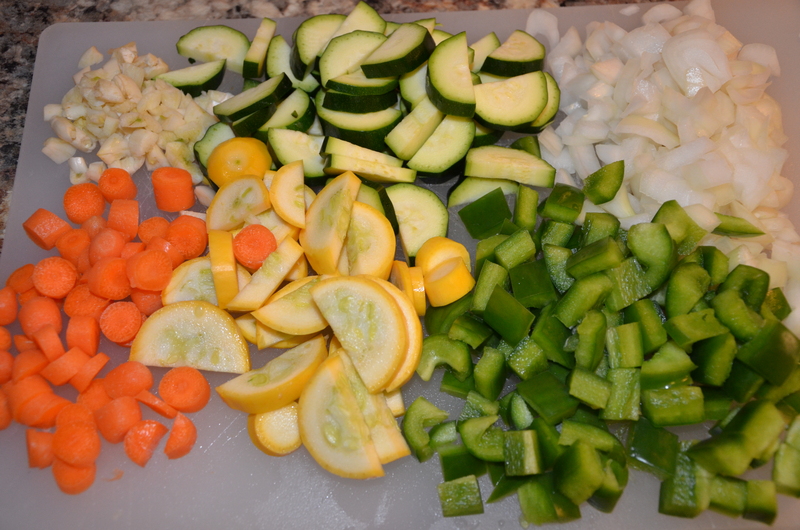 While the chicken is cooking, begin preparing your vegetables. 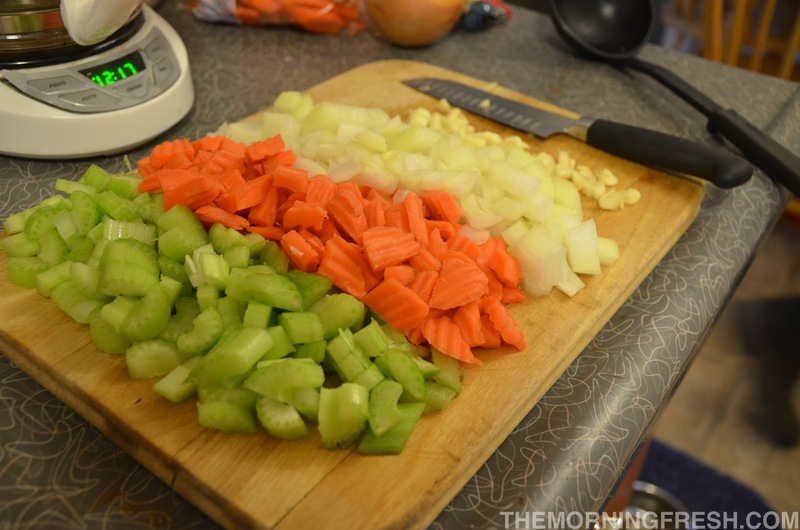 Dice the onion; slice each celery stick in half, and chop; slice and halve the carrots. The size and thickness is up to you – I prefer to make my veggies in a variety of sizes to make each bite a surprise. 3. After about 10 minutes, check the chicken – if there is no pink left in the middle, drain it and set it aside to cool for a few minutes. 4. While you’re working on the chicken, toss your vegetables and two cups of water into the pot. I added a small amount of chicken broth, to soak up some flavor while the veggies softened. Add celery and carrots first, then onions later. Now is a good time to add salt, pepper, and garlic powder to the pot. – At this time, you should also set a separate pot to boil, and cook your package of egg noodles. 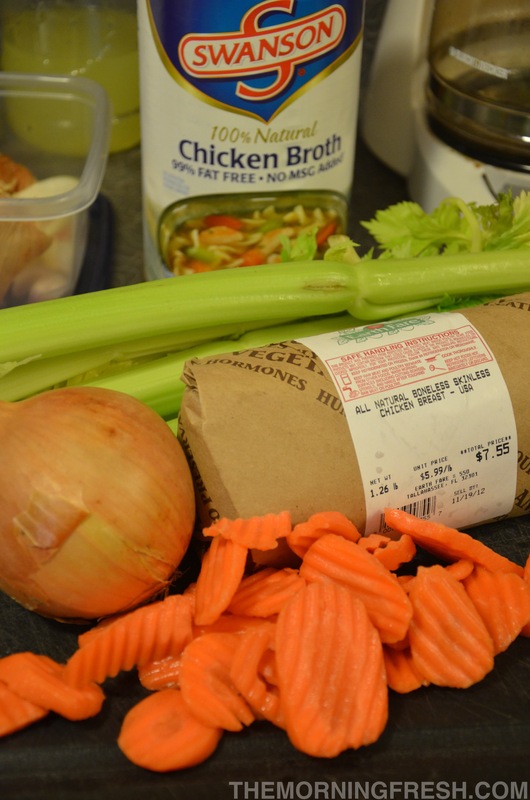 NOTE: I do not cook my egg noodles all the way; I leave them al dente because they will continue to absorb the broth in the soup (this is a great way to avoid getting them too mushy during storage). 5. Once you can handle the meat, begin to pull the chicken apart with your fingers (or a fork). 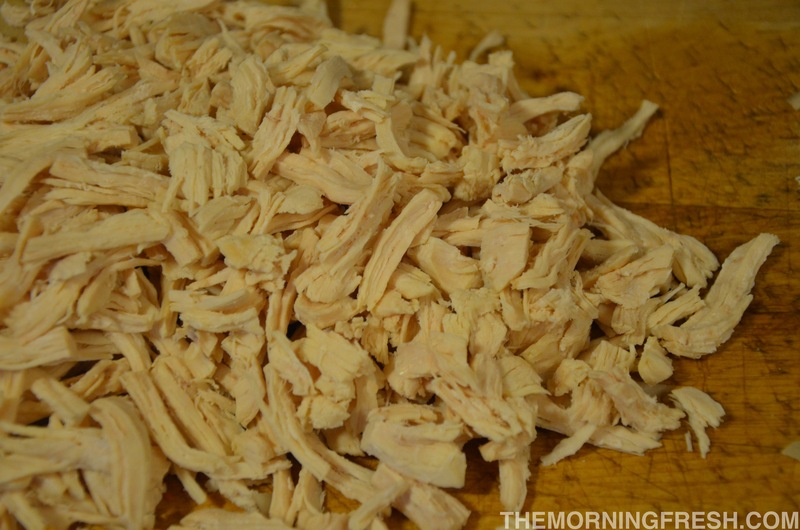 You’ll quickly find that what began as a small pile of chicken chunks will grow into a rather large heap of shredded meat. 6. 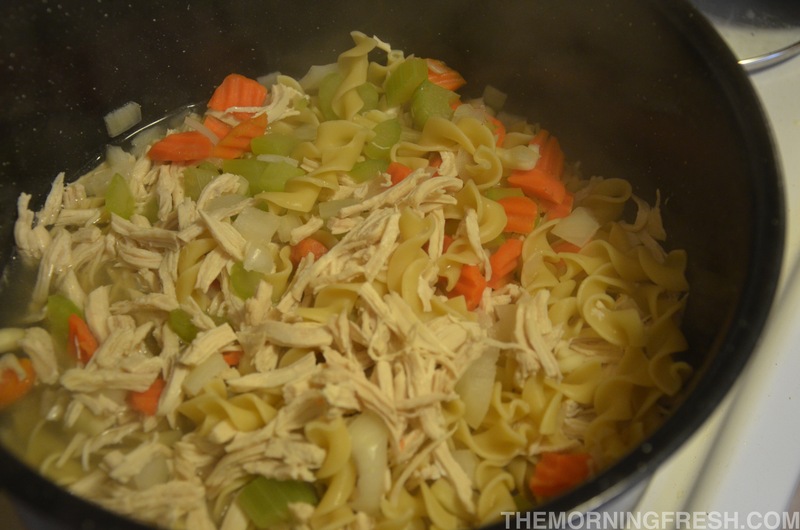 Add the chicken, remaining broth, noodles and any other leftover ingredients, to the pot (I didn’t drain the noodles, I added the water along with ‘em). Once the soup reaches a bubbly brew, toss in the bouillon/seasoning cubes. Continue to season to taste, if necessary. 7. Begin the waiting game. Set the soup to a simmer, and occasionally stir and taste for at least two hours. The longer, the better – but it may be hard to resist the temptation of pouring yourself a bowl. 8. 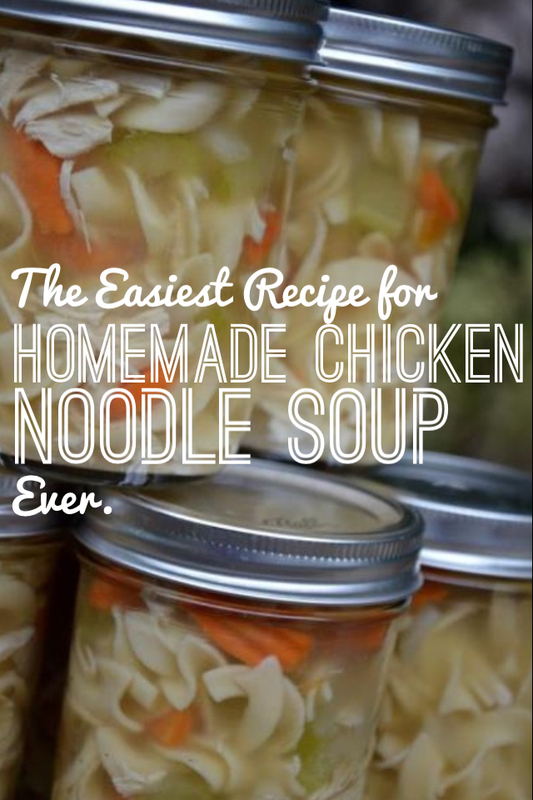 Ladle your soup into mason jars, and set some aside in the freezer (not completely full), and some in the fridge to be eaten quickly. Do you love soup, too? What’s your favorite flavor? so let me know which variety I should experiment with next! For more foodie fun, check out my “For The Foodies” board on Pinterest. And if you liked this recipe, add it to your boards – and give it a ‘thumbs up’! This week, I wore my favorite flannel shirt for like 3/4ths of the day without dripping in sweat – and therefore, it is totally autumn. As always, I woke up extra early and bolted to the nearest Starbucks to get my first fall-flavored latte on September 4th – the first day they appear back on the menu – but I must admit, it was a bit painful to shell out the $5 for my tasty treat. After testing out a few different recipes, I nixed a few ingredients, made a few tweaks, and came up with my own (slightly) healthier version of this pumpkin-flavored drink. And when I say ‘healthier‘, what I really mean is that I used 2% milk instead of whole milk, and only refilled my whipped cream once instead of five times. Baby steps, right? 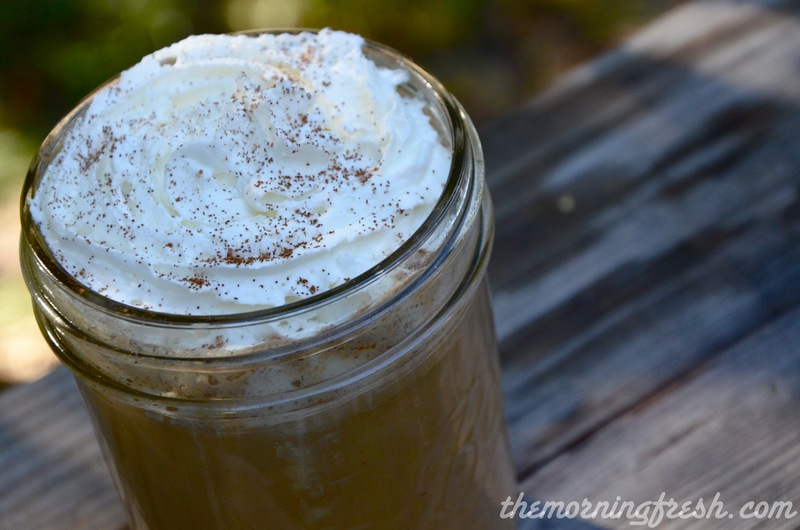 What could be better than a homemade pumpkin spice latte served in a mason jar? In a microwavable bowl or cup (OR MASON JAR! 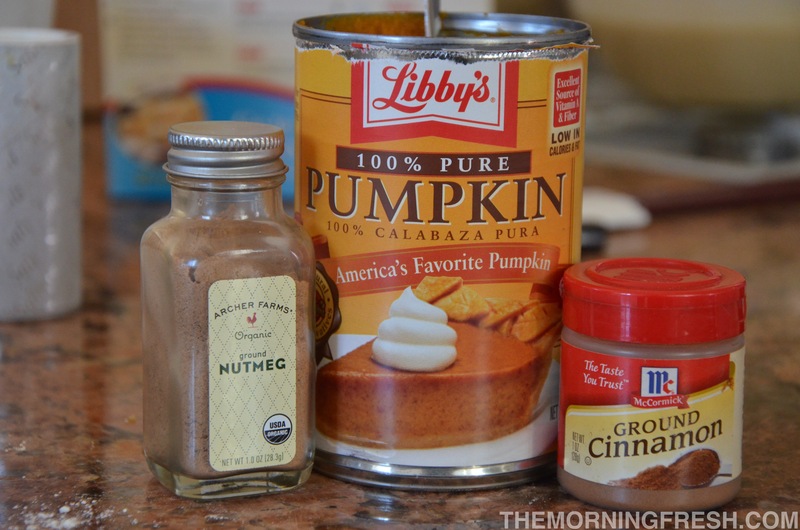 ), mix together the pumpkin mixture ingredients (milk, brown sugar, vanilla extract, pumpkin pie spice, and pumpkin puree). It’s best to use a whisk, but for us dirtbags, a thorough mixing with a regular ‘ole spoon will do. Microwave the mixture for about 1:45 (minutes). The timing may vary, so keep an eye on your milk – you want it to get nice and frothy. 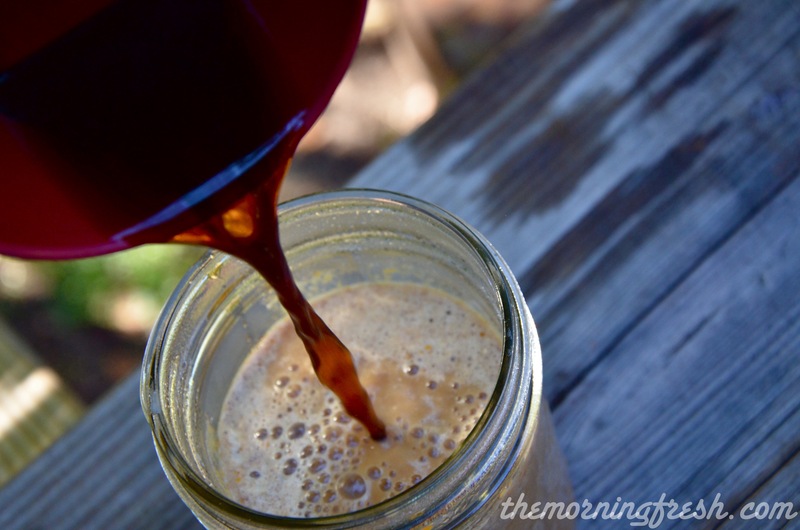 Pour the frothy mixture into a tall glass (ahem, MASON JAR! ), and add your coffee. Stir in half & half, and sugar. I use sugar cubes to control my outrageous sugar portioning, but a spoonful or two should be fine if you use it in non-cubed form. It’s all about personal taste! Load up on the whipped cream. And feel free to continue loading up on the whipped cream! Sprinkle some cinnamon on top, if you so please. Note: Personally, I tend to take forever to finish my coffee. I like to let it sit around and get a little cold before I drink my coffee – disgusting, I know. If you’re like me, be aware that the pumpkin puree tends to settle on the bottom after sitting around for too long – so drink up quicker, or be sure to stir your latte so you don’t get a mouthful of pumpkin at the bottom. This recipe will provide the yummy goodness of one fairly sizable latte. I usually end up making one for both Niko and myself, so I just double up on the ingredients for the mixture, then let Niko add cream/sugar as he pleases – he likes his coffee more bitter, so he adds way less sweetener than I do. There you have it folks, a homemade alternative to your favorite Starbucks drink. 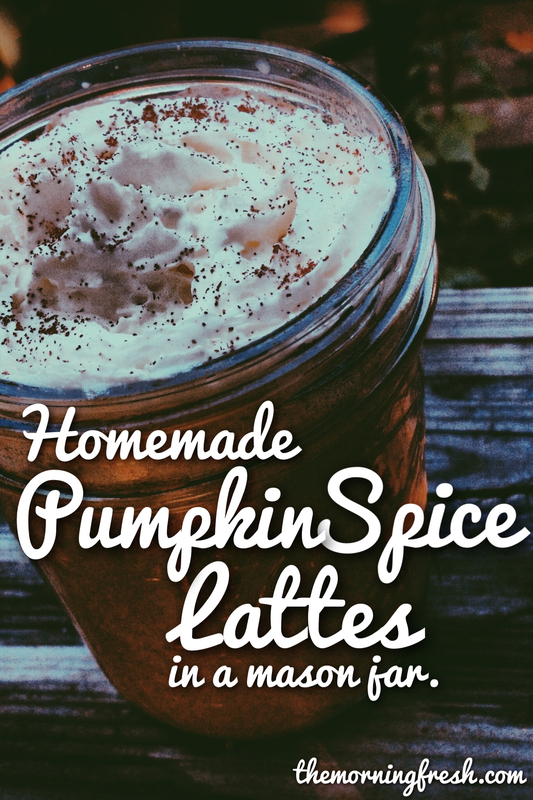 This do-it-yourself pumpkin spice latte is way more budget friendly than the Starbucks version, and you don’t have to change out of your pajamas to enjoy one! I’ve been drinking them in the mornings out in my garden, and it’s become my favorite way to begin chilly fall days. Plus, everything is better in a mason jar. Do you love pumpkin spice lattes as much as I do? 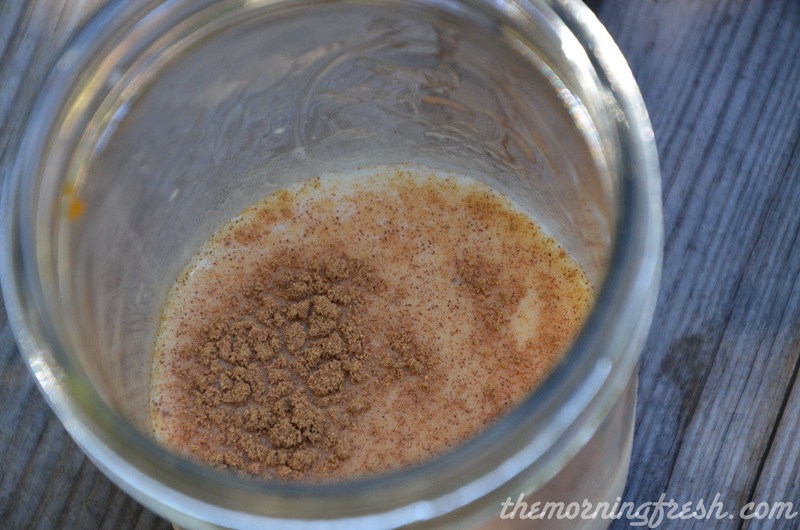 Have you tried any other homemade versions of Starbucks drinks? For more foodie fun, check out my “For The Foodies” board on my Pinterest. And if you liked this recipe, add it to your boards, too! I work from ‘home,’ which means one of two things: I’m either cooped up all day at the little wooden table in our kitchen, or I’m holed up for hours at a coffee shop. Either options inevitably puts me way too close to tempting munchies. And let’s face it, my willpower is weak. Snacking is something that I simply can’t not do. I love to munch, my belly is always begging me for treats, and frankly, I just really adore food. My first experience with kale came when my lady friend Teresa (who is a truly phenomenal gardener/baker, this chick defines “green thumb”) moved away to Texas. 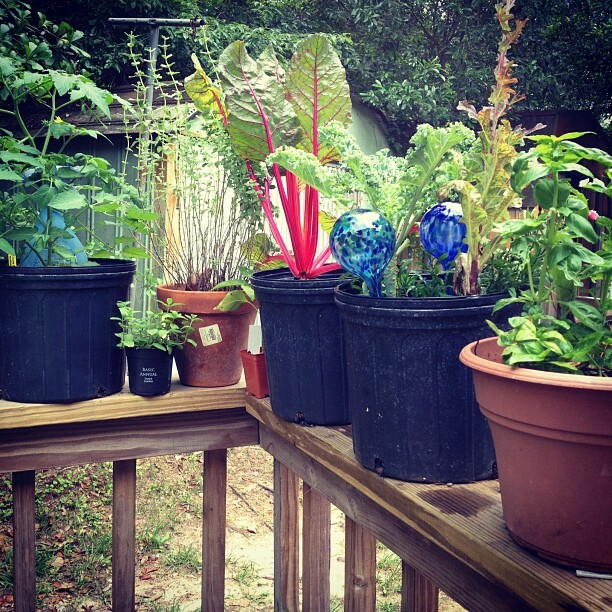 She bequeathed me one cherry tomato plant, one Tabasco pepper bush, a chard, and three little kale stalks. 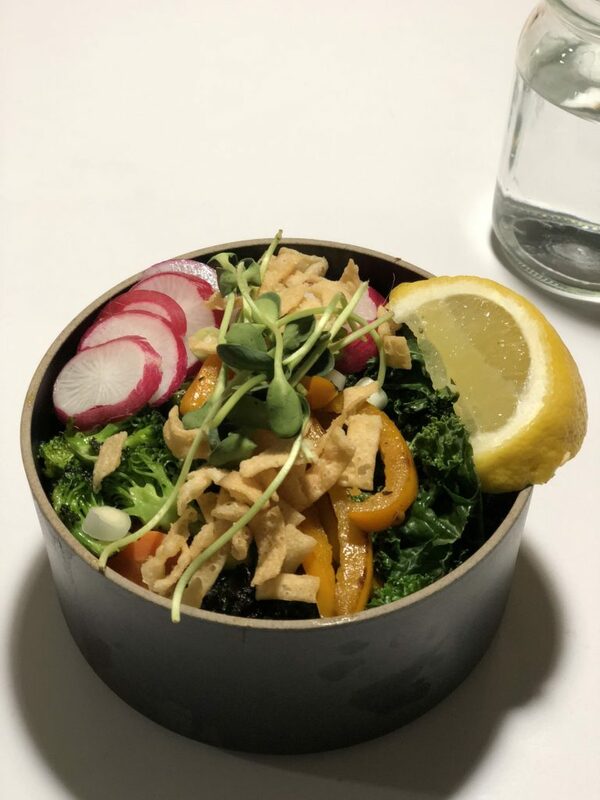 I had never eaten kale before, but had seen a few recipes for kale chips – so I decided to give it a try. The first three batches were a complete disaster. 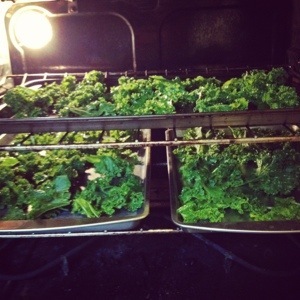 I was using this kale chip recipe, which instructed me to bake them for 15 minutes at 375 degrees. I burned those poor kale leaves to an inedible crisp every time. Eventually, I realized this recipe simply wasn’t working, so I decided to do things my own way – and now, I get perfectly crisp, perfectly flavorful kale chips. 1. Kale – Bonus if you buy it local at a farmers market or grow your own! 2. Salt and/or your favorite seasonings – I am all about garlic salt and black pepper; keep it simple. 4. A Sookie Sheet – Or, in my case, many cookie sheets. 2. Prep your kale. I buy mine from local farmers, so they’re often full of little caterpillar buddies – which means I have to take about 15 minutes to scrutinize each leaf and save any critters who might be snacking on my kale. Rinsing your kale is recommended, but be sure to properly dry it afterwards. I just got a salad spinner, and aside from being really fun, it’s really essential for drying out the kale. 3. Break up each big leaf into bite-sized pieces. Mine are usually about two inches long, with some smaller pieces mixed in. Tear the leaf along the thick spine, and toss that spine afterwards. It’s a bit tough to chew on compared to the flaky leaf parts. 4. Toss all the kale into a big bowl, and drizzle olive oil over it – the amount depends on preference and how much kale you’re cooking, but be sure that each leaf is slightly coated. Season to your liking, but don’t be shy with the salt! It really does a lot to overpower kale’s natural bitter flavor – and makes your kale chips taste just like potato chips. 5. Arrange the pieces on a cookie sheet. I try to get ‘em all pretty flat, but they inevitably overlap a little – which is fine, kale shrinks A LOT when it bakes. Just don’t make it a big jumbled mess; you’ll need to toss ‘em halfway through. 6. Put your cookie sheet into the oven, and bake for 20 minutes. Halfway through, pull the tray(s) out, and flip each piece of kale to ensure even crisping. 7. After 20 minutes, check on your kale to see if each piece is entirely dried out. I often end up pulling out the majority of my kale chips, then putting a handful back in the oven to finish up – the pieces are never perfectly uniform, so some may take a little longer. Final step: Devour your delicious kale chips, totally guilt free. In the rare event that you don’t finish your entire batch in one sitting, you can store kale chips for a few days in airtight containers. Just be sure that there is no moisture in any of the kale chips – that’ll make the rest of ‘em soggy. And no one likes a soggy kale chip. Did you know kale is loaded with antioxidants, and provides 100% of your daily Vitamin A, C, and K in just one cup? Yeah, it’s that good. 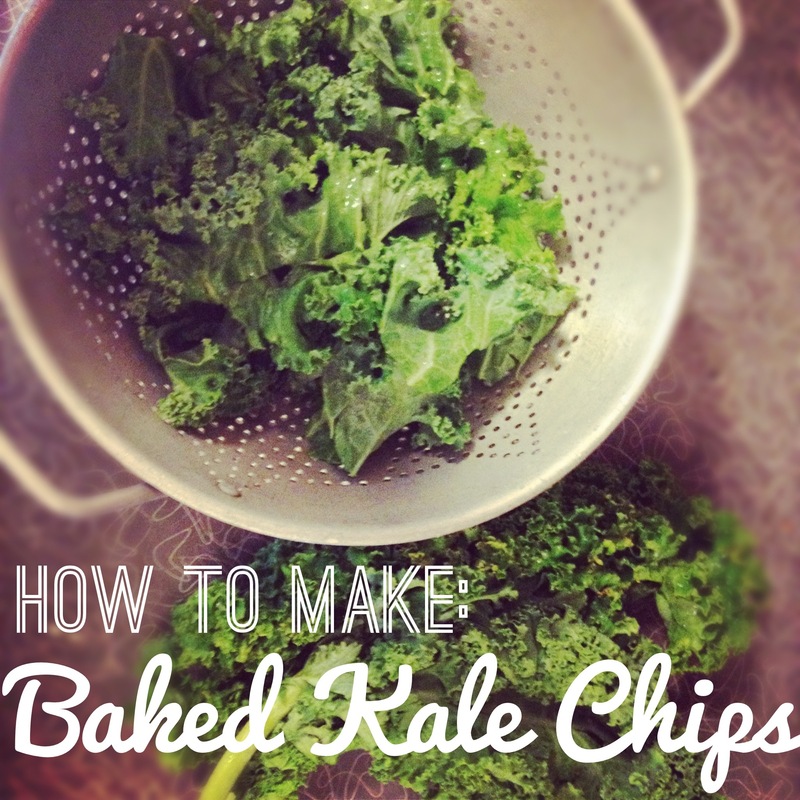 Have you ever made your own kale chips? Have any suggestions or tips to add to my how-to? Do you love kale chips as much as I do? For more delicious foodie recipes, and healthy eating tips (with a few totally not healthy indulgences mixed in), check out my For The Foodies board on Pinterest. About a month ago, Niko and I instituted what may be our greatest tradition of all time – Saturday morning dates to the farmers market at Tallahassee’s Market Square pavilion. Each week, we take a leisurely drive across town to the familiar covered gathering spot where a collection of local farms congregate to peddle their edibles. This weekend, we made the ultimate discovery – well, I did. While scouring for fresh garlic, Niko guided me over to a smaller stand run by an unfamiliar woman I hadn’t seen before. Her table was heavy with winter melons, chanterelle mushrooms, fresh green onion stalks, and two baskets full of squash blossoms. I immediately bounced on the blossoms, while Niko looked at me with a very puzzled look on his face. “Uh, flowers for dinner?” is basically what his expression read. Silly boy, Niko had clearly never experienced the tasty delight of noshing on an edible flower. 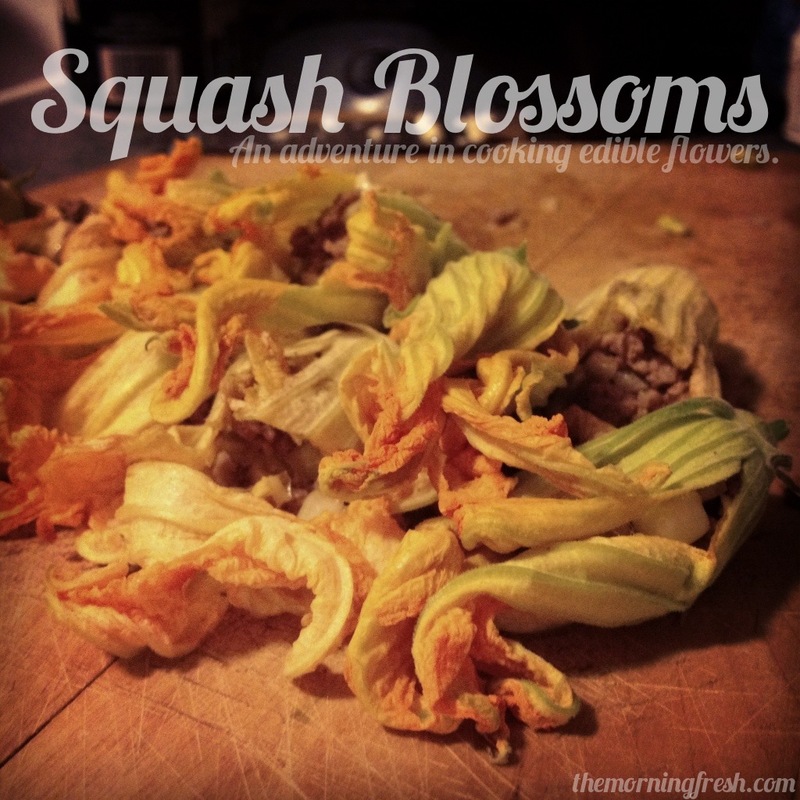 I hadn’t eaten squash blossoms in years, let alone ever actually cooked it myself, but I was determined to make it work – so I paid the meager $3.00 for my basket of blossoms, and dumped the dainty flowers into my produce bag. It is the season of feasting, and what better seasonal ingredient to overdose on than pumpkin? Our household cranks out pancakes for breakfast, lunch, and dinner, so it was only time before we started spicing up the mix – with pumpkin, of course. I recently stumbled across this blog post on Cait’s Plate about a sinisterly simple way to transform your pancakes into pumpkin permeated treats, and my housemate Hannah and I immediately became smitten with the idea of pumpkin spiced pancakes. It really is all too easy; all we had to buy was a can of pumpkin. So here’s the not-so-secret recipe for adding a little seasonal spice to your breakfast routine. 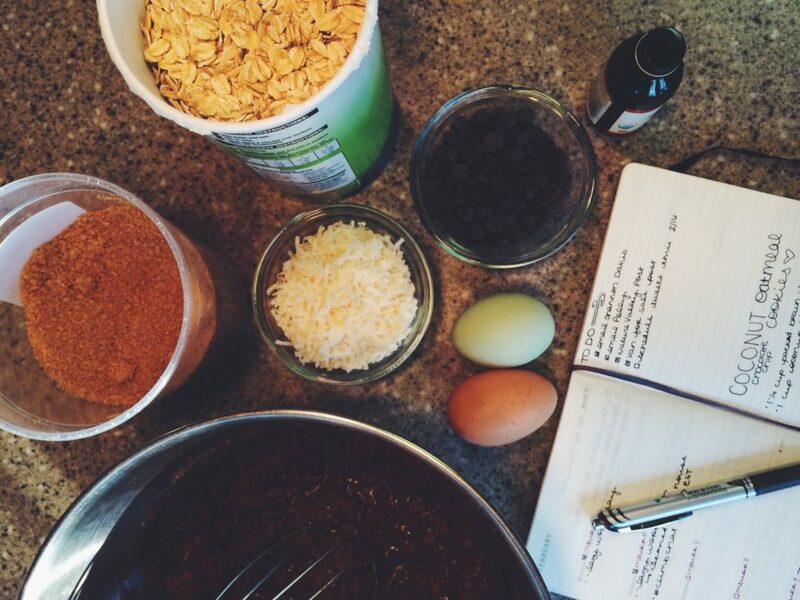 You make your pancake mix like always; any mix will do. We got a nicer brand, simply because according to Hannah, “pancake mix is one of the places in life where you don’t go for the cheaper brand.” – I can stand by that! Once you’ve got your pancake mix ready to go, the fun comes in. We eyeballed the canned pumpkin addition, but about 1/3 of the can seems suitable. 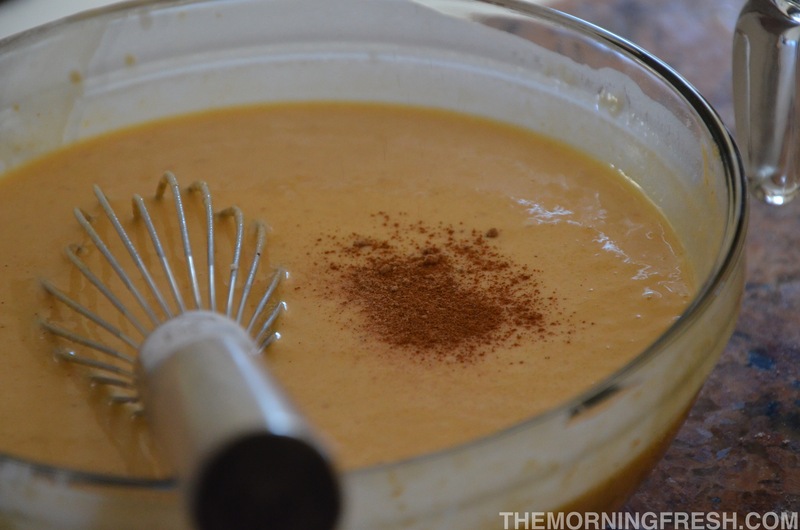 Just plop a heap of that orange goodness into your mix, stir it in, and taste. Spices are definitely your friend for this little cookout – don’t be shy with the seasoning! Whip it all together, season your batter to taste (we like a lot of nutmeg), then you’re ready to pour your liquid gold onto a frying pan and watch it fluff up into a perfect pancake. I’m not the most skilled pancake attendant, but I did manage to make one pancake in the shape of a mouse. I’m pretty proud of it. 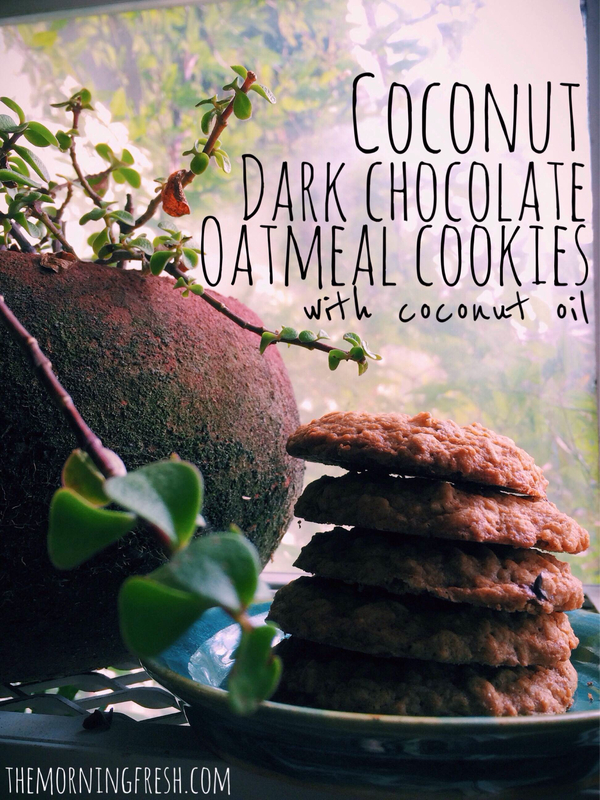 This simple fall-flavored breakfast treat couldn’t be easier to make, which instantly qualifies it as a new favorite. Grab yourself a can of pumpkin, experiment a bit with different spices and tastes, and dig in. 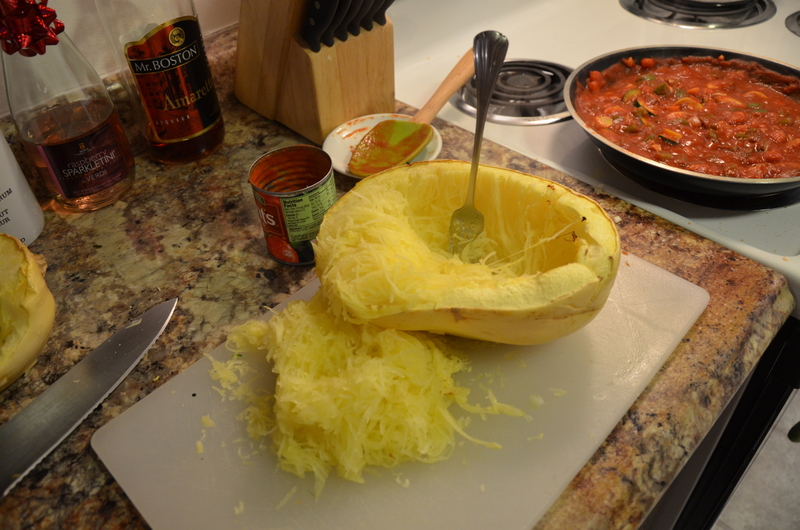 As promised, I engaged in another session of spaghetti squash culinary experimentation. This time, I made sure to take plenty of photos to share with my loyal readers. The occasion for the evening? My good friend Ashley was making her first visit to the new condo, and we decided to ban all man-folk in favor of a ladies’ dinner. Here’s how to whip up a phenomenal dinner of spaghetti squash in a homemade tomato sauce with veggies: First, split open your giant squash. My first attempt at Marisa’s house involved a long round of slashing and knife wielding, but this second effort proved much easier. 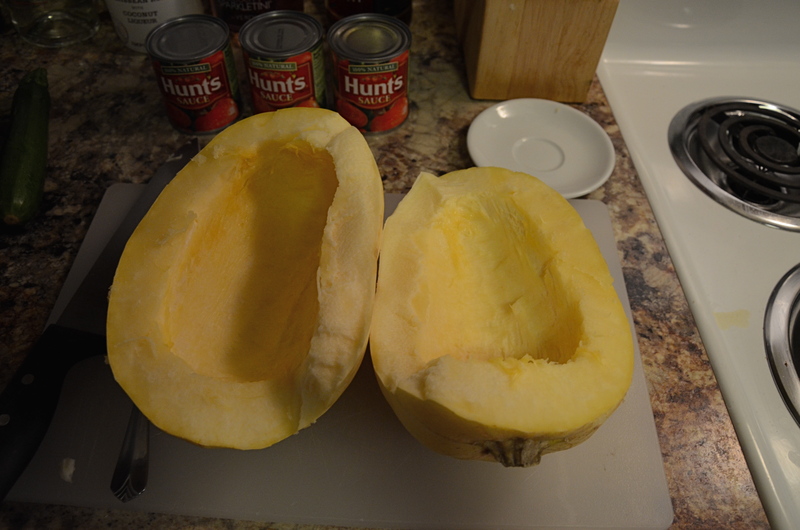 I was able to easily wedge my biggest knife into the squash and crack it open, as is shown in the first picture below. Next, I scooped out the gooey pulp in the same manner you would approach gutting a pumpkin, as illustrated in the second picture. Then, pop that sucker into the oven at about 425 degrees, and let it sit for a while. 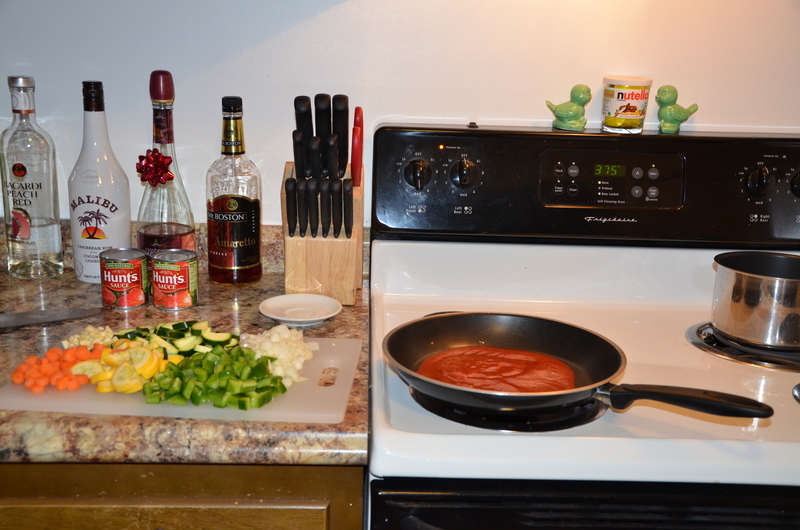 In the meantime, I got started on chopping all the veggies and preparing the sauce. 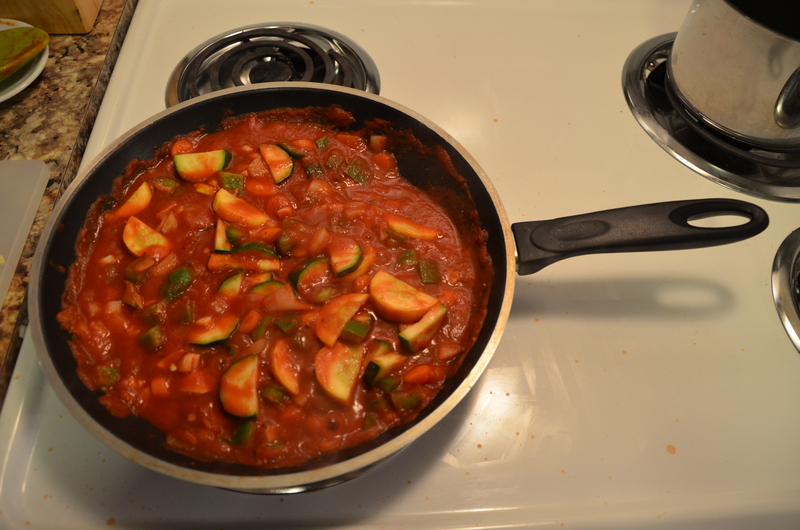 I included green peppers, onion, yellow squash, zucchini, carrots and garlic for this sauce. My only regret is that I wish I had chopped up the vegetables more finely, so keep that in mind. 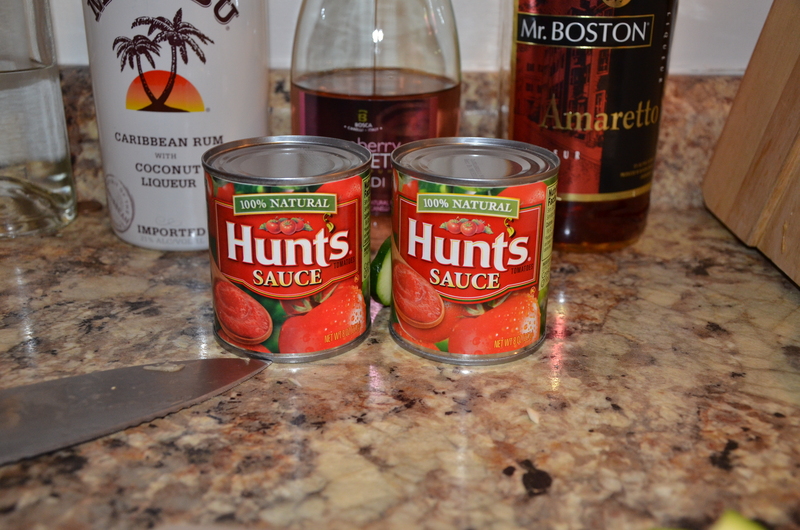 The sauce was made using regular ‘ole Hunts canned tomato sauce and a whole load of spices. My favorite part of cooking? 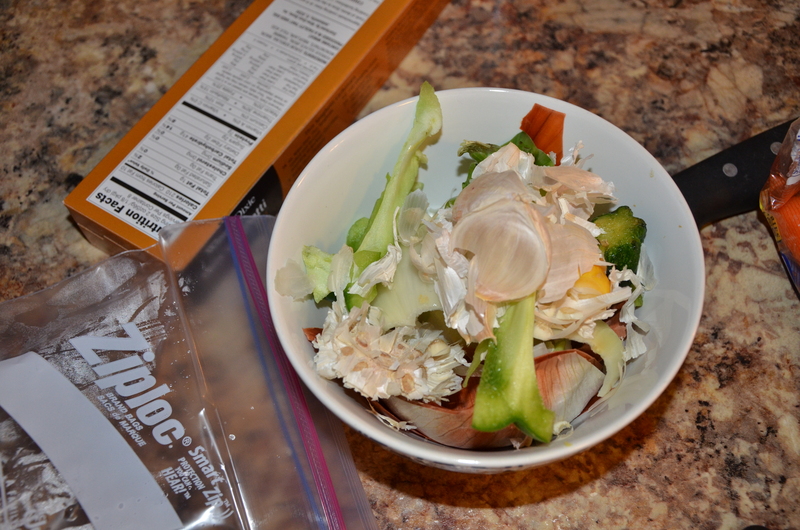 My ‘crap bowl’ – it’s the spare bowl where all scraps, onion skins, garlic butts and other cooking debris get tossed. Once everything is all prepared, toss your veggies into the sauce and let them simmer for a while to release their flavors and soak up the spices. 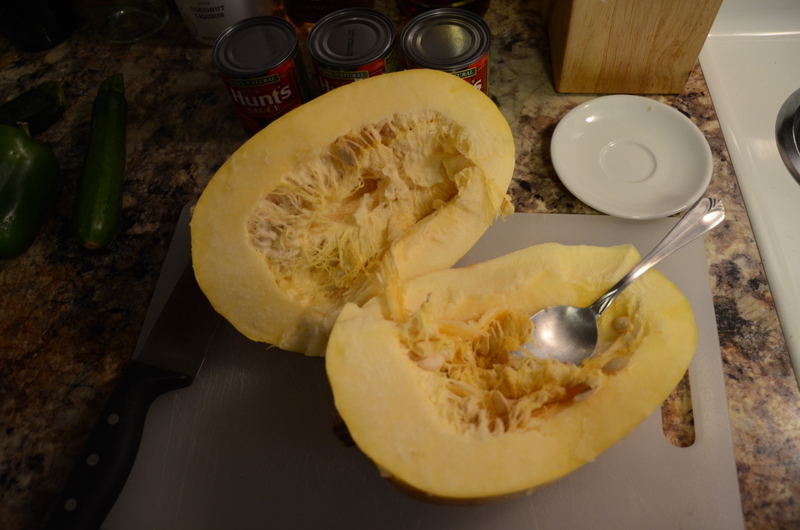 Your spaghetti squash will be ready for forking soon, so check up on it frequently. You’ll know it’s ready once you can run your fork against the fleshy inside and long strains of squash peel off like, well, spaghetti. Then throw that goodness into the sauce and let everything cook for at least ten minutes, on low. Don’t pull a Katie and try to cook everything on high – it won’t work. When everything has had time to properly simmer, sizzle and sauce-ify, you’re ready for dinner. You can eat spaghetti squash solo, but I enjoy putting a small bed of regular spaghetti underneath to add some variation to the texture of each bite. Adding regular pasta is also a great idea if you’re looking to keep lots of leftovers, or if you have a large group of guests to feed. We paired our saucy morsels with freshly baked rolls, crisp salads with mango poppy seed dressing, and a new brew I picked up, Cable Car Amber Ale – which tasted strangely like soy sauce in my opinion. Now if you’ll excuse me, I’m off to the coast. Niko, Jeff and Kendal have gone off on a 90-mile bike ride to Saint George Island – crazy, I know. They set out at about 7:00 AM this morning, and a group of us will be riding in a caravan, in cars, to meet them out by the beach. We’ve planned an evening of camping either on Saint George Island or in Tate’s Hell National Park, and will enjoy cold beers under the stars, warm embers from our campfire and sleeping in the hatchback of my car. It ain’t a climbing trip, but it will definitely be an adventure. Enjoy your long weekend, readers!